In Windows Server 2012 Microsoft includes support for Datacenter TCP (DCTCP). What are the goals of Datacenter TCP? DCTCP requires ECN (RFC 3168) capable switches. Customers that have large amounts of data flowing within their data center. How to I turn on DCTCP? 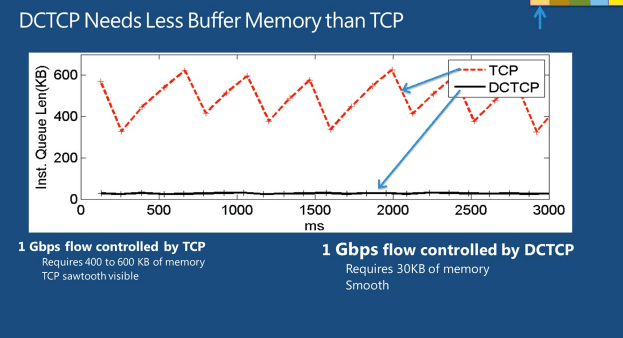 Datacenter TCP will be always on and self-activating based on RTT of TCP packets. No Management needed. With the PowerShell cmdlet Get-NetTcpConnection can you check if DCTCP is used. What features are compatible with DCTCP? All features in Windows Server 2012 are compatible with DCTCP. For more information about Datacenter TCP in Windows Server 2012 checkout the TechEd session from See-Mong Tan VIR303 – An Overview of Hyper-V Networking in Windows Server 2012.